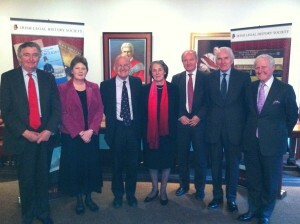 Chief Justice Keane, Lord Chief Justice Judge, Chief Justice Denham, Lord Chief Justice Morgan, Lord Hutton and Lord Carswell (l-r) at the 2012 AGM and discourse. The Irish Legal History Society’s mission is to encourage the study and advance the knowledge of the history of Irish law, especially by the publication of original documents and scholarly works relating to the history of Irish law, including its institutions, doctrines and personalities, and the reprinting or editing of works of sufficient rarity or importance. Accordingly, its publications are an essential part of any library that aspires to cover Irish legal, social and political history. In addition to its publishing programme, the Society supports research through its postgraduate research studentship scheme and travelling bursary. The Society also hosts the WN Osborough Composition Prize in Legal History, and awards the Irish Legal History Society Gold Medal. Please access news and events for further details on occasional research grants and Society events, including the Annual General Meeting, which is held every autumn at alternate venues throughout Ireland. You may also connect with the Irish Legal History Society on Twitter and join our Facebook group.